New York, January 7, 2014 – Herrick, Feinstein LLP announced today that Meghan O'Reilly joined the firm, effective January 1, 2014. 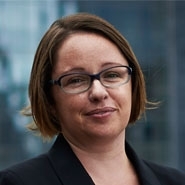 Meghan O'Reilly joins Herrick's Financial Institutions practice from Clifford Chance, where she was counsel in the firm's Finance practice. Meghan focuses her practice on the representation of a wide range of financial institutions in commercial banking transactions, including subscription facilities, corporate loans and other asset backed finance transactions, including real estate loans. She has, to date, been the relationship attorney for approximately $40 billion of private equity-focused loans, been extensively involved in the formation of the policies, forms and regulatory strategies governing various lender products, and has spent significant time as primary in-house U.S. counsel for the U.S. expansion of a major global bank. Meghan received her B.A. from the University of Waterloo and her Bachelor of Laws from Osgoode Hall Law School at York University. "Meghan adds significant depth to our debtor-side bankruptcy, and our lender-side finance capabilities," said Irwin A. Kishner, chairman of Herrick's Executive Committee. "We are pleased to welcome her to Herrick."